Eight of us just returned from a magnificent cultural and culinary trip through Turkey with Turkish Flavors, organized by Selin Rozanes. If you are a foodie, do not miss this trip!! We visited Istanbul, Cappadocia, Ephesus, and Bodrum, among other places, and loved it all because of our wonderful guides, the accommodations, the food, and the variety of experiences. We visited a typical cave home in Cappadocia (and stayed in a marvelous cave hotel there); had cooking classes, including one with a local family; went to a local school, rode a hot air balloon, and had a delightful day on a gulet in Bodrum, where we swam and enjoyed a wonderful lunch on board. In addition to visiting the important cultural sites, such as Hağia Sophia, Chora Church, the Rustum Pasha Mosque, Basilica Cistern, and more, we toured several marketplaces, such as the Spice Market, and tasted many local delicacies. Look at the web site to see more details of the trip. At the end we could not believe how much we had seen and experienced. We only wish we could have had two or three more days. Every meal we had was better than the last and the accommodations throughout were first rate! Thank you again for this marvelous trip!!! My husband, adult daughter and I recently took Selin Rozanes’ 11 day “Turkish Flavours” tour. What an amazing experience of exploring, tasting, cooking, and meeting never-to-be-forgotten people. Selin is attentive to the details of making this trip all it can be for her guests – the accommodations were not only first-rate in quality, but each was unique in it’s physical offerings as well as location in the region we were visiting. The team of guides and cooks Selin has put together is outstanding – knowledgeable; each very diverse, involved in their communities, not just in cooking lessons; flexible to the tour guests needs/preferences; engaging and wonderfully fun to spend time with. The 4 cooking lessons were menu specific to the region we were visiting and took place in 4 very different settings. While Selin was not on the entire tour with us, she was talking to our guides daily and also to us, to make sure all was going smoothly and to find out if there was anything we needed. We traveled, explored, and ate our way through 4 different regions of Turkey (Istanbul, Cappadocia, Alacati and Bodrum), then came home wanting to visit and know more about this beautiful and intriguing country. Thank you for a very special experience Selin! It’s been almost three weeks since we completed the Explore Turkish Flavours tours with Selin Rozanes – just wanted to make sure that what we said was not biased by the immediate afterglow of the experience. This was a once in a lifetime experience where you get to experience another nation’s history, culture, and cuisine with a front row center seat with an added backstage pass. What makes the tour so special is the personal involvement of Selin. She not only makes the arrangements but personally participates in the activities and makes changes to the planned itinerary as local conditions or the desires of the participants dictate. For those readers not available to participate in this twice a year event, the spice market tour and the cooking class at Selin’s home were both parts of this tour that can be booked separately and are not to be missed. If you’re a foodie, it doesn’t get any better than this!! If you decide to take this tour make sure you are up for days that are full of activities that require walking and a disciplined appetite. Selin also help us with arrangements for excellent tours in Istanbul for days prior to the tour that allowed for us to adjust to a seven hour time zone change and see some of the city sights not included in the tour. If you are a Foodie and like to eat/cook/explore then Selin Rozanes’ Turkish Flavours tour of Turkey MUST be on your bucket list. We had such a memorable, fantastic, scrumptious, enjoyable experience that words can’t describe it! Not only did we get to do the sites in Istanbul, Cappadocia and the west coast but we also ate at authentic (not the touristy garbage) gourmet restaurants that served regional fare. In addition, we got hands-on cooking lessons in homes and restaurants learning how to make family recipes and of course, eating the results of our work. In the process we met some wonderful people. Turks are a warm, friendly, hospitable people and meeting them this way made us feel welcome and so much at home. We truly did not want to leave. Interesting, interested, and humorous. You sure were accommodating. Linda and I would never have been able to visit that Exhibit about the History of Istanbul without your help. And I am going to take the train to NYC this afternoon, with my new cellphone pouch you gave me from the Bazaar, around my neck. You really thought of everything that could possibly make our trip work.I can’t get you out of my mind. You are such a presence. SUMMARY: A friend and I took the 11 day Culinary Trip through Turkey in May and LOVED it. Although we are both well traveled, neither of us had been to Turkey before, so we balanced our interest in learning about the local cuisine with a desire to see the major sights. We are two women in our mid 50’s, one American and one British. Most of the “food” portion of the program was overseen by Selin R., and the cultural component directed by Faruck B. You couldn’t have nicer or more knowledgeable hosts. Both of us have traveled a wide range of the economic spectrum, and were very impressed with the value offered by this package. On the few meals where we were on our own, we were directed to wonderful restaurants (which we recognized after one unfortunate night at a tourist trap we found on our own) which were beautiful and popular with locals. FOOD: We toured the markets (old and new), tasting, learning, (buying! Great spice mixes, teas and saffron) and lunching on the way. Selin has many favorite shops and restaurants, but will detour and explain anything which catches the eye. There were lessons at Selin’s home, a village house and one of the hotel restaurants where we could participate as much or as little as we wished. Questions were welcome, even by the village lady who was more enthusiastic an instructor than I could imagine with Faruck rapidly translating. It was a fun party of flour, kids, English, Turkish, pots, pans, and grape leaves. The restaurants were all delicious and several were visually spectacular. The food ranged from casual to quite elegant. HOTELS: The hotels were mainly the ones on Selin’s initial list, with a couple of substitutions based on availability (staying at the one where we cooked one night) and upgrades. The Blue House is comfortable and fabulously located in the old town. We switched to the Ciragan Palace on our last night to spend some time on the Bosphorous, which while luxurious and lovely was hardly necessary and seemed a poor value later. The most fun was the Yunak Evlari, a cave hotel. These are all solid and comfortable small three to four star hotels. TOURING: The time apportioned was enough to see the main sights of each area (Istanbul, Cappadocia, and Bodrum on the Aegean) at a reasonable pace. Faruck and Selin are good at helping calculate when to get going and when you can sleep in if that’s how you are so inclined. You could do this tour without any other research and see more than most would see after hitting the guidebooks for months. They were also excellent at advising on the suitability of other sights under consideration for us to tour on our own. We had no problems with taxis and touring on our own in the evenings or on the extra day we added to the tour. EXCELLENT EXTRA’S (that make all the difference): It was fantastic to be able to eat and visit in private homes. This is something which elevates one from tourist to traveler. All of the hotels had extremely friendly other parties comparing notes at breakfasts. Don’t do room service coffee even if it is your norm. My traveling companion also served up a “nightmare client” double whammy of being unable to eat meat and having a work crisis which often glued her to her blackberry. Selin and Faruck handled it with aplomb; switching out some dishes and letting her work while making sure I didn’t miss out on anything. We had very comfortable vehicles and drivers at our disposal, but also rode on public ferries and trams to get more of a local feel. Selin appears to evaluate people’s comfort with being on their own, and adjusts accordingly. She won’t send you off in a taxi on your own unless you prefer that, which we did. We also did a day on the islands near Istanbul, which gave a great sense of how Turkish people really live. This tour is a well balanced combination of tourism/history, food, culture and modern Turkey. It covers everything but still leaves space for people to pursue other interests. An excellent trip to a gorgeous country! Hello Selin,I hope this message finds you well and your business continues to flourish. This message is long overdue, however I wanted to write to you to thank you for making the cooking lessons with my friends and family so special. It was the highlight of their pre-wedding festivities and provided some wonderful memories. PS The beautiful artwork you gave me as a wedding present is the centerpiece of our living room. I LOVE it! Thank you! July 4, my day with Selin in her kitchen, turned out to be one of the highlights of my trip to Turkey! I had some time to myself while my husband was working, and this looked like a unique way to enter the culture. It absolutely was. Selin invited us into her home as guests and taught us to cook side by side with her with the caveat that she was doing “home” cooking rather than a cooking show. The seven of us working at the cooking block stations quickly bonded, and we all came away with authentic recipes we can replicate at home. The experience culminated in our luncheon together eating our creations in Selin’s beautiful dining room and sharing travel and home experiences with Selin like a family. I plan to prepare a six course meal the next time I entertain my extended family! I haven’t stopped smiling about the experience. Thank you, Selin! Our niece and nephew recommended this tour, which they’d taken a year ago, and we now recommend it to you. We loved our day with Taciser, who spent several hours leading our family of three adults through the extraordinary Spice Market, making stops to sample drinks, foods, and spices along the way. Having worked in the grocery business, Taciser knew the best vendors, and coupled these tastings with lots of information. We were able to stop and purchase along the way, yet, never was there any pressure to do so. We then were ferried over to the Asian side of Istanbul to tour the vast and impressive vegetable and fruit market. We’ve never seen anything to rival these markets. The day ended with a lengthy tasting lunch at Ciya, a world class Turkish restaurant, with a world class chef, located in the market. The dishes kept coming…each one exciting and delicious. Clearly, the freshness of the ingredients, seasonings, and uniqueness of the recipes pulled together the day’s experience. Taciser was lovely, informative, and helpful. This is an Istanbul experience not to be missed, and well worth the price. A wonderful day for a foodie! I spent the day with Selin who took us on a tour of the Spice Market and then to the Asian side of Istanbul, the Kadikoy market. She’s fun, expert and passionate. We ate beyond our capacity…all the shops she brought us to and all the treats that we tasted really gave a complete overview of the cuisine of Turkey. I learned a lot, had fun and tasted many, many, many delights! For anyone who enjoys food and is curious to understand the cuisine of Turkey, Selin is the real deal! The Turkish cuisine is world famous, and rightly so as you will experience during your stay. Turkish food is diverse and savory, spicy without being (too) hot, vegetable rich, and healthy thanks to the generous use of olive oil. Once back home, visitors often crave for these delicious dishes but fail to replicate them. 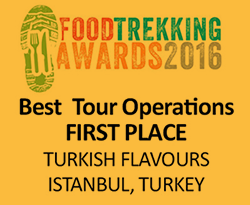 This is why Selin Rozanes started Turkish Flavours back in 2007. She offers a full immersion into Turkish gastronomic culture with her hands-on cooking classes. This month I participated, and discovered Turkish Flavours is actually much more than just a cooking class. Here’s my experience. I was expected at Selin’s house at 10:30 on a Saturday morning. It’s located in Nişantası, and I received detailed directions by mail in both English and Turkish (for the cab driver). The house dates back to the 1930′s, and has been family property ever since. Selin welcomed me, and introduced me to the rest of the cooking class participants — two girls from the US and a man from Belgium. Over a cold glass of cherry juice, Selin told us she was born and raised in Istanbul, worked all her life as a culinary travel specialist and individual travel consultant. After she retired back in 2004, she started Turkish Flavours, where she offers Turkish cooking classes, Istanbul food tours, and cultural culinary tours in Turkey. A local experienced chef was about to teach us local cuisine — as good as it gets. Chopping vegetables at Turkish Flavours. After we got to know each other a bit, we moved to the kitchen. There was a big kitchen counter that can host up to 10 participants, with the stove and oven at the far end. Everything was already set up and waiting for us: cutlery, cutting boards, cookware, spices, herbs, and a stylish apron. We also got a Turkish Flavours recipe book and a spice chart to make notes. All these we could keep at the end of the cooking class. Selin handed out today’s menu, which contained no less than 8 (!) different dishes the four of us were going to prepare. Needless to say you shouldn’t eat too much for breakfast. Although the menu changes according to the season (only fresh produce is used), to give you an idea, here’s what our course menu looked like: flaky pastry with feta and herbs (peynirli börek), green beans in olive oil (zeytinyağlı taze fasulye), zucchini in olive oil (zeytinyağlı kabak), split belly eggplant (karnıyarık), spicy bulgur (baharatlı bulgur pilavı), purslane salad with pomegranate molasses dressing, carrots infused in garlicky yoghurt with tahini and walnuts, and apricots stuffed with clotted cream (kaymaklı kuru kayısı). To win time, Selin and her assistant already washed and sorted all the vegetables. Time to get started. Making flaky pastry during our cooking class. We pretty much went over the dishes one by one, and prepared them all together. Selin only gave step by step instructions and taught us basic techniques needed for Turkish cooking. That’s right, we did 99% of the actual cooking. She also let us taste the different spices, oils and ingredients before we added them. And for every item, she explained what region they came from, and where you can buy them to take back home. Maybe a word of advice here, don’t wait for the very last day of your journey to join a class. You’ll probably want to go shopping and stack up on herbs and spices before you head back home. While we were chopping, cutting, mixing, stirring, frying, and eventually assembling the dishes, Selin talked about the origin of the dishes, and Turkish culture in general. She also took great pleasure in listening to our Istanbul experiences and happily answered any questions we had, being it Turkish food, travel advice, politics, you name it. We learned and laughed quite a bit while cooking — the cooking class actually turned out to be group of friends gathering for some kitchen fun. Finally, eating the lunch we prepared with excellent Turkish wine. About 2,5 hours later, all the dishes were ready to be served. We sat down at a nice, large table in her living room and enjoyed the food we just prepared accompanied by a glass of Turkey’s finest wine. During the lunch, we kept on sharing Istanbul experiences and tips, as well as future travel and sightseeing plans. The food was delicious, and I’m not saying this because I helped preparing it. At about 3 p.m., after an excellent Turkish coffee to top it all off, it was time to say goodbye and thank Selin for a truly great Turkish cooking class filled with excellent tips and tricks. It was a magnificent experience. My own go at split-belly eggplant, courtesy Turkish Flavours. A week later, I decided to prepare one of the dishes at home, on my own, based on what I learned and the recipe booklet I received. I decided to make karnıyarık, the split belly eggplant. I chose this one, because I know Turkish people just love it when made correctly. So, I put on the Turkish Flavours apron for the occasion, followed the instructions and used the techniques I recently acquired. It was smooth sailing, no surprises or split decisions. I deliberately made too many, so I could share them with my Turkish neighbors. And the local critics were unanimous: a job well done, one even said he wished his wife could make it that nice. I found out about Selin and Turkish Flavours from the Luxe series of travel guides. She was listed under a section of the guide that covered things that should not be missed. The guide was right. We did two experiences with Selin. The first one was a cooking lesson and dinner at her wonderful apartment and the second was an excursion that covered visiting the spice market, the market in Kadikoy and then a fabulous lunch to follow. The cooking lesson or experience was exactly what we were hoping for. We are serious “foodies” and had done something similar in Bologna at a family’s home. Aside from learning about the recipes and techniques, it really grounds you in the culture and Istanbul life in a way that cannot happen outside of someone’s home. We made a number of courses all the while learning about Turkish foods and drawing on Selin’s vast knowledge of the region and culture. There really is no substitute for having someone show you the secrets of how to prepare dishes. Learning from a cookbook pales in comparison. After we prepared the meal, we sat down to a leisurely dinner where we got to enjoy the fruits of our labor and learn more about Istanbul. While Selin is strident in her beliefs, she also proved to be the most reliable source of info on the right kind of restaurant recommendations and how best to use the time that we had to see what we wanted to see. I would argue far more reliable than our hotel! Hi Selin,Guess what? I have now made dinner for the past two nights and served “Turkish Flavours” Selin food…… to raves. I stuffed eggplant with tomatoes and onions, plus some ground turkey meat, and then the next night, I stuffed different colored peppers with your aromatic rice and added chopped lamb meat. For dessert, I made stuffed figs, prepared in the thick sugar and water sauce, marscapone, rolled in ground pistachio nuts. I really had fun and feel good.it All this is to thank you for such a fabulous trip. You thought of everything and everything went like clockwork. Your choices of activities was so varied, it blows my mind. But we did it all and had a terrific time doing it with you. You are such good company; interesting, interested, and humorous. You sure were accommodating. Linda and I would never have been able to visit that Exhibit about the History of Istanbul without your help. And I am going to take the train to NYC this afternoon, with my new cellphone pouch you gave me from the Bazar, around my neck. You really thought of everything that could possibly make our trip work.